Every year I prepare my turkey in more or less the same way. And every year it's absolutely delicious. 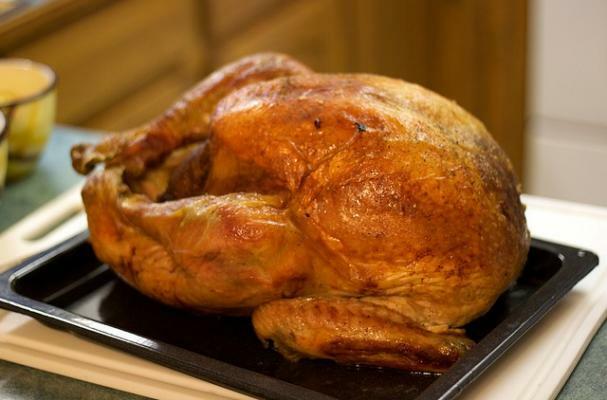 Herb roasted turkey is so simple but imparts such a wonderful flavor. The bird is rubbed with garlic, olive oil, salt and pepper. Then the area between the skin and meat is smothered in an herb butter that slowly melts as the turkey is roasting. This helps to keep the meat moist and juicy. You and your family will fall in love with this herb roasted turkey recipe. Rinse and dry turkey. Rub the skin with a clove of the garlic, olive oil, salt and pepper. Stuff the cavity with the bay leaves and garlic cloves,. Soften butter and add the remaining herbs, mix together. Place 1 tablespoon butter mixture in to the cavity. Place butter and herb mixture between the turkey meat and skin. Place turkey on foil lined pan. Bake at 350 until done, will be different depending on the turkey's weight.